I’d been hearing how wonderful this book was for forever, so I finally picked up at copy at Reno’s Sundance Bookstore. The story of two twin brothers born to an Indian nun and a cold, British surgeon father in Ethiopia, the book is told mostly from the perspective of Marion, the older of the pair by just a few minutes. The mother, who hid her pregnancy from everyone, dies in childbirth; the father, Thomas Stone, disappears immediately afterward, leaving the twins to be raised by Hema and Ghosh, two other doctors at Addis Ababa’s Missing Hospital. 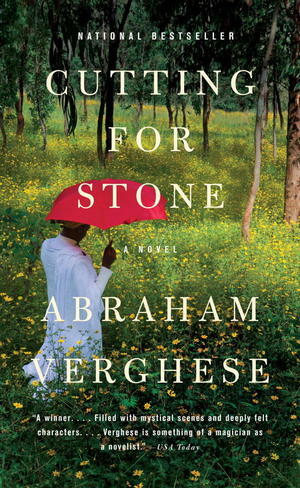 Written by a doctor, Abraham Verghese, the story chronicles the happenings at the hospital, which occur as Ethiopia is on the brink of revolution, and to New York City, where Marion eventually moves to pursue medicine. It’s a well-written and intriguing plot, though I did have some problems with the story. There is a lot of detail in the operations, which is wonderful, but some that seemed totally unnecessary. For example, Marion discovers that Ghosh is getting a vasectomy, which he wants to keep secret from Hema. I kept waiting for that to play into the plot—maybe Hema mysteriously gets pregnant? Maybe she wants biological children?—and was disappointed when it apparently led to nothing. My other major problem was that Verghese saved much of the “big reveal,” aka, the mystery behind Thomas Stone, for the very end. I suppose that was the only place where it made sense, but there were so many new characters and other information saved for the final pages that it drove me a little crazy. On another note, I liked that he didn’t make the love story end nice and clean. That particularly thread is instead messy and unfulfilled, which, although it may seem a little disappointing, is one of the truest to life ways to end a fictional romance that I’ve ever seen. My take? An engrossing read that is definitely worth picking up!